The retail industry is experiencing an explosion in new data types and research methodologies. Everyone recognizes the need to develop and apply insights for competitive advantage. Yet, for many retailers, the challenge has become how to convert an ocean an information into insights for business planning and monitoring in a cost effective, sustainable manner. TPG has developed a proprietary model that organizes, prioritizes and applies the retailer’s wealth of data and research for effective planning and monitoring. 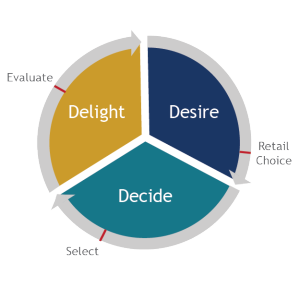 This model is synchronized with the consumer-shopper journey and helps marketers and merchants to reduce the information overload while driving more action and sales gains from research and data. Ultimately, Customer Insights Activation is a tangible tool for developing and activating meaningful insights. Assessment: TPG will conduct a thorough review of the client’s data, research, insight development and activation processes, systems, tools, and organization capabilities including best practice benchmarking and a competitive analysis. Data & Research Architecture: Application of the client’s data and research to TPG’s 3D model for turnkey utilization for business planning and monitoring. We will then create proprietary data modeling or research protocols leveraging the client’s untapped data or research facilities. Data & Research Acquisition: TPG will help with the prioritization and conduct the facilitation to acquire the desired research and or syndicated data. Data & Research Income and Policy: Identification of data and research that could be sold to suppliers or data providers. Creation ore refinement of policies related to selling or sharing proprietary data and/or research. Insight Factory Design: TPG will design the insight development and activation processes that will be fully integrated into the core business planning and monitoring work streams. Also, TPG will help with the creation of an insight repository. Organization Capability: Identification of the required organization structure, competencies and training regimen are necessary to build the desired insight development and activation capabilities. TPG will design and implement these and create an Insight Center of Excellence to build leading-edge capabilities.